Sorry, I can’t help myself. I call this an intervention as well. Good to have had the decision making taken out of your hands. All’s well that ends well. Glad you weren’t hurt and yay for your Celica GT. 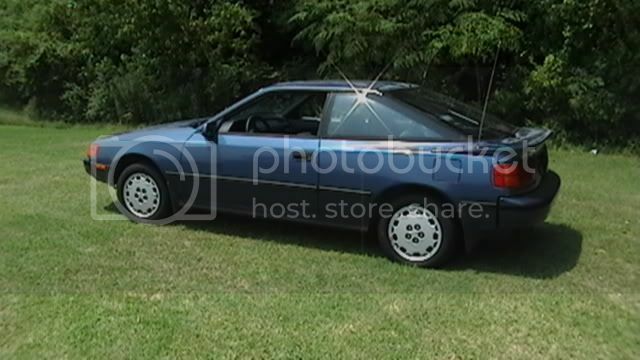 Getting from A-B is a given, but not necessarily in Hubby’s gifted 1995 Oldsmobile Cutlass–that’s just not me, lol. Thnx, Tess! I like to keep a car for a long time. Takes away that angst of getting a ding or scratch on it. Plus it’s nice to drive it long after it’s paid off. I recently got a new car though, and now that angst is back again. Then again, that new-car smell can’t be beat! Being payment-free, after 5 years with that danged minivan is enough incentive to not go new again, lol. Got to experience new with my Celica, so I can claim that twice, if I include the minivan. Had the full rustproof treatment done on the Celica before I picked it up–not just the undercoating–so I never got to enjoy the new-car smell anyway. I am sorry to have missed THAT experience. Plus, I have trouble letting go, so I’ll hang on to my dearie Camry for as long as I can :). Thnx, Carrie! Hubby and I like to keep our cars for a long time. Shortly after Noodge 1 was born I sold my Honda Civic 5 speed, which I loved, for a minivan. Noodge 2 showed up a year and a half after Noodge 1, how did that happen, and I was glad for the space. Kept that puppy for 11 years. The engine was still going strong, but the plastic stuff on the inside started wearing out. Traded it in for my Dodge Durango which I love! Nothing says “get out of my way” like that silver, chrome plated grill. My brother leased a Durango when they first came out. Got to drive that baby twice to/from airport to pick up our mom, who was returning from Italy at the time. Loved how it handled! Loved it enough to write it into the sequel to my debut novel, lol. Thanks, Stacey!